4 film, 4 disc collection of early science fiction/horror movies from Hammer Films. DD-Video R2 UK boxset. Anyone famous in it? Imported American actors Dean Jagger and Brian Donlevy are the biggest names. Fans of 1950s sci-fi should enjoy these smarter than average pictures. Visuals All films are Original Aspect Ratios 1.33:1 and Black and White. Picture quality is decent throughout. Audio All discs have good sounding original English mono tracks. Extras Discs include interviews and trailers, plus detailed 24 page booklets for each film. Packing/availability Cardboard box with four standard amaray cases inside. All four films are available on identical single disc releases. Other regions? ABUS and German E-M-S DVDs are available of all of these films, but these discs include more bonus features. 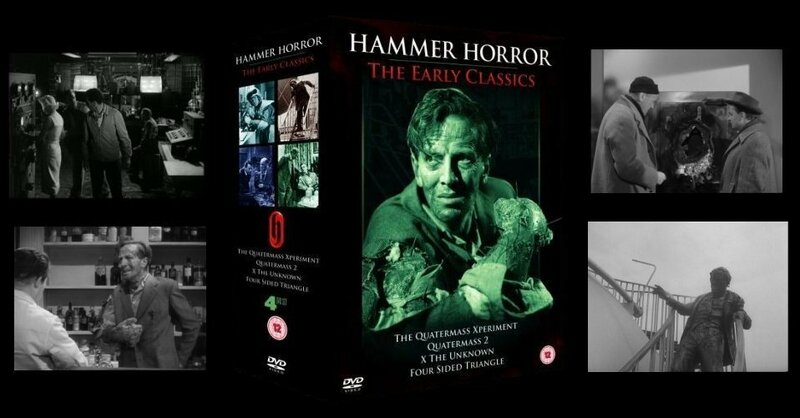 Some interesting early moves by Hammer into horror themes, and some smarter than average scripts make these films recommended. A collection of good prints, with some very interesting extras for each film - this is how all DVDs should be done! All text in this review written by Timothy Young - July 2006.